A GATHERING OF PROFESSIONAL AND PERCUSSION STUDENTS UNITED BY THEIR LOVE FOR THE DRUM AND ITS RHYTHMS. The main focus is given to rhythm learning and techniques, ideal sessions for those wishing to discover and /or to improve their skills with some fun and authentic rhythms. Ages welcome : from 12 years old onwards . Participants are advised to bring their own percussion instruments, eg: Congas, Djembe, Cajon, Snare, Shakers, Floor Toms, Cow Bells, etc…. A suitable seat is recommended. Advice is gladly given on tunning, maintaining or purchasing the right drum/instrument for you. Drumming affects us in profoundly uplifting ways. This is why people all over the earth have drummed in some manner throughout history. In the past few years, studies conducted in hospitals and universities have documented the health and healing aspects of drumming. Playing drums, whether solo or with a group of people, relieves stress, increases vitality and puts us in the transcendent state of clarity and heightened awareness that athletes sometimes call the Zone. 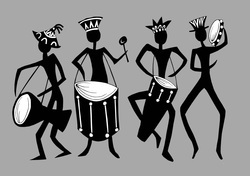 Drumming also gives us physical vitality because it is also a very physical activity. It gets our hearts pounding, our blood flowing and releases the endorphins (the pleasure hormones) . It is a great way to use our bodies, to simply work up a sweat! Our bodies need, and love to be used, when we use our bodies properly thus we are rewarded with increased stamina, strength and flexibility. Drumming is fun! It's a great way to feel the pure joy of being alive! Drumming with others is a universally time-honored way to create a feeling of community and trust. Drumming is one of life's many great gifts!